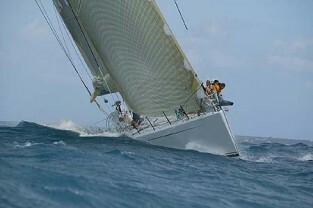 Two hours 30mins after the start and 35 miles later Pyewacket took line honours at the end of the first race in the Heineken regatta in St Maarten, beating Morning Glory by 55 seconds. But for me, aboard Pyewacket and many others watching, it was the spectacle of these two extraordinary maxis slicing downwind that was most impressive. The final result was almost incidental. Seeing an 86 footer planning with ease makes the hairs on the back of your neck stand up whether your watching or participating and carving through the 250 boat fleet at 20 knots plus is not something I’ll forget easily either. When you see them in the flesh and in action, these boats really are as impressive as many have been suggesting and offer an exciting vision of the future for high performance racing. This is no ordinary step change in design, and far from the normal incremental improvement on last year’s model. And while they may not have won the first race on handicap, there’s more than a hint that the MaxZ86 sisters are about to blow the doors off the ‘conventional’ turbo sled opposition. Yet the reason for their success is no secret, the canting keel is at the heart of this massive leap in performance and everyone knows it. Including the crew. ‘How much fuel did you use today Doug?’ quipped one of the Pyewacket crew at the race de-briefing. ‘Lots, I showed that engine no mercy,’ came the reply. Doug Rastello is the keel trimmer aboard Pyewacket, a crew role unheard of until now, but given today’s impressive performance it’s a role that could well become commonplace aboard future racing boats as the trend towards canting keels gathers pace. Swinging 8 tonnes through 110 degrees in under 10 seconds takes a huge amount of force from the dual hydraulic rams concealed beneath the cabin sole but just the touch of a button for the crew. Yet behind the scenes trimming the keel to each twitch of the boat takes a 250hp to swing the lead, the same as having a BMW 530i below decks with the throttle wide open. And yet it’s not simply the grunt that’s required to move the keel that’s impressive, it’s the amount that the lead gets swung and how frequently it happens that grabs you most. “The job’s not really that difficult,’ said Doug, “‘Keeping her on her feet is pretty straightforward and only requires you to push a few buttons. But she needs constant attention, you just can’t go anywhere else,” he said. Thinking back to the pre-start it was easy to see what he meant. Feeling more like a dinghy than I have ever experienced aboard a keelboat, when the sheets were eased the rig rolled in to weather. Anyone sitting with their backsides to the rail got wet. Bear away and we were upright again, powered up and accelerating like a giant 49er. From dead ahead, Pyewacket and Morning Glory are skinny like you’ve never seen, anorexic maxis that depend almost entirely on their keels to balance their giant sail plans. Like any modern high performance dinghy, it’s this configuration that contributes to the electric performance. In real numbers this meant 11 knots upwind and up to 23 downwind in the 18-20 knots breeze that prevailed for most of the race. Multihull numbers and at 2hrs 30mins for a circumnavigation of the island, including an extra couple of legs after the start, only just short of the current record time set by Playstation. If nothing else it seems like the mono multi-hull has arrived.